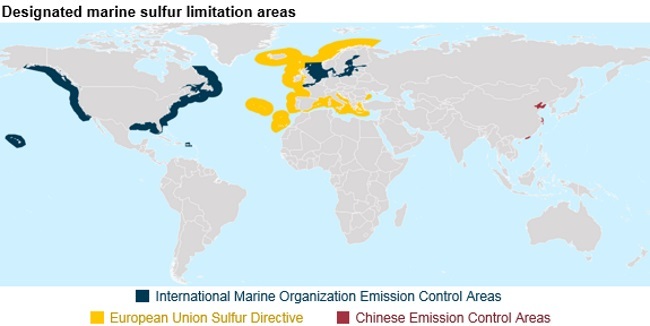 The upcoming 2020 rules apply across multiple countries' jurisdictions to fuels used in the open ocean, representing the largest portion of the approximately 3.9 million barrel per day global marine fuel market, according to the International Energy Agency. Another option is to use scrubbers to remove pollutants from ships' exhaust, allowing them to continue to use higher-sulfur fuels. However, the process of installing scrubbers can be costly and can increase a ship's operating costs. A small portion of existing marine vessels has already installed scrubbers, and that portion is not expected to increase greatly before 2020 because of time constraints and limited installation capacity. Even if scrubbers become widely adopted, which would allow the continued use of fuels with higher-sulfur content, the price and availability of higher-sulfur fuels after 2020 remains uncertain. 15/12/2018 00:00 - Navios Maritime Acquisition Corporation Completes Acquisition of Navios Maritime Midstream Partners L.P.